Legend would have you believe that the fearsome figure of Rob Roy McGregor, at some point in the time of Rebellions, leapt across the vast chasm of the raging Leuchar burn with English forces hard on his heels. There could well be some truth to this encounter with Culter's best-known visitor. Rob Roy (Roy from the Gaelic "ruadh" meaning "red-haired") had relatives at Dalmaik near Drumoak. It was here that Rob Roy paid a visit to his clansman James Gregory towards the end of 1714, to rally support for the Jacobite cause. James Gregory's grand-father, John Gregory, born in 1598, had been the minister at Dalmaik church. James Gregory was appointed as Professor of Medicine at King's College, Old Aberdeen in 1725. His son, also James Gregory, succeeded his father in the same post. Many descendants of the McGregor clan will still be in the area- the surnames of Gregor, Gregory, Greig, King, Peters, Skinner, Stalker and Walker were all adopted by the McGregors during their years of persecution by the authorities. Rob continued on his mission, to rally McGregors to the Stuart cause, and gathered a substantial force to fight the Jacobite cause in 1715. Rob Roy died at Balquhidder in Perthshire on 28th December 1734. And so, more than a hundred years after his death, around 1850, a ships figurehead of a Highlander was brought out from the docks of Aberdeen with the esparto grass and rags used in the Paper Mill. John Anderson, a carter employed by the Mill had a brother on board the whaling ship "Rob Roy" and from him he got the redundant figurehead. Two logs of wood were stuck on for legs, a pair of lead boots were fashioned and a piece of canvas served as a kilt. The manager of the Mill, Robert Arbuthnott, gave permission to place the commanding figure up on the craggy rocks of the Culter Burn. The wooden figure lasted until a replacement was commissioned by public subscription. 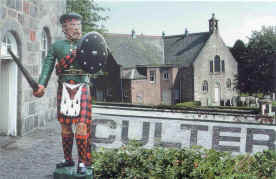 Mr Stephen, farmer at Alton Farm was created Provost of Culter for the day for its unveiling on 2nd March 1870. The statue was well maintained but suffered the indignity of being used as target practice by the Territorials before the First World War. In 1926 , a further incarnation of Rob Roy was created. The figure was carved from a log of Yellow pine by a woodcarver called Graham of the Hardgate in Aberdeen. For many years local painter, George Shaw and R Geddes undertook the hazardous task of varnishing and repainting the Highlander. 20 shades of paint were needed for his make-over. In 1987, Barratt's Developments handed the title deeds to Rob Roy's rock to William Gavin, a trustee of The Rob Roy Preservation Society for £1. Mr Geddes continued to maintain Rob until his death in 1999. Once more in 1991, as the weather took its toll, Rob Roy saw a further change of face - to see in the next Millennium. The new statue was carved by Arnold Smith. Rob Roy was unveiled on Friday 28 June 1991 by Mrs Catherine Findlay and it was followed by a Grand Ceilidh hosted by Norco. The previous Rob Roy can now be visited at the Heritage Centre- as Life Member of the Trust 118. 2017 will see a further version of Rob Roy take up residence on the rocky outcrop as the Rob Roy Preservation Society continue the tradition for future generations of Culter residents.